Good morning and Happy Meatless Monday! 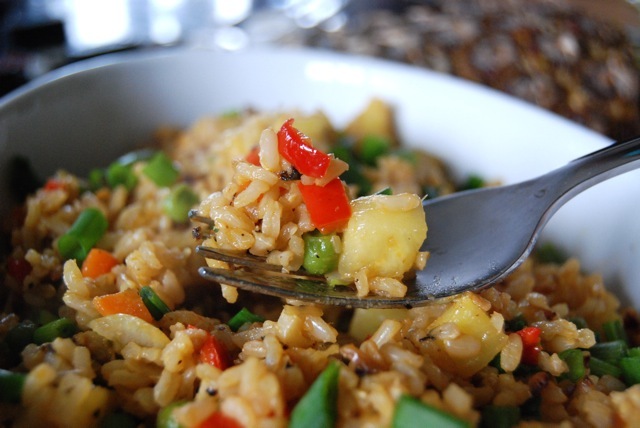 Spicy, fun, even a little decadent, Pineapple Fried Rice is the perfect day-before-Valentine’s-Day meal. A delicious combination of sweet and savory flavors, soft & chewy textures, made even better through the use of brown (versus white) rice. It’s perfect as is, but for a heftier one-dish vegetarian meal, feel free to add some scrambled egg or cubed tofu. To keep this acceptably low in sodium, you’ll need the lowest-sodium soy sauce you can find. I recommend either House of Tsang Less Sodium Soy Sauce (320 mg sodium per tablespoon) or Angostura Lite Soy Sauce (330 mg). Both are readily sold in supermarkets and available for purchase online from Healthy Heart Market. In a pinch you can also use Bragg Liquid Aminos – which I personally adore, though it’s higher in sodium that the other two products. Contemplating what to cook for Valentine’s Day?? 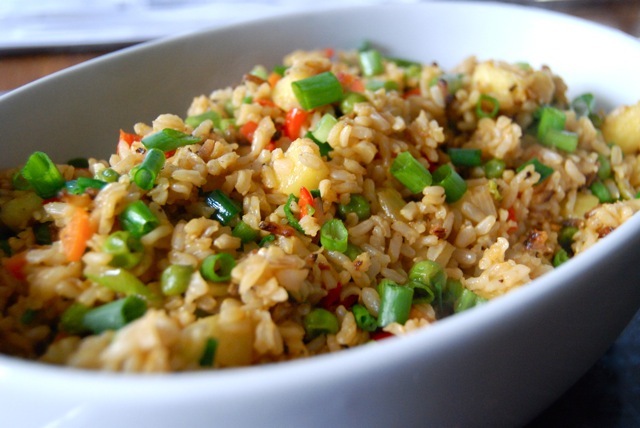 Make Pineapple Fried Rice as part of a “Chinese Take-Out” themed dinner. It’s scrumptious with low-sodium Spicy Sweet-and-Sour Chicken, Kung Pao Chicken, Beef with Pea Pods, and/or Stir Fried Bok Choy (in the Recipe Index!) PS: Don’t forget the fortune cookies! Recipe courtesy of Vegetarian Times, January/February 2012. Measure 2 cups of the broth and all of the rice into a saucepan. Place pan over medium heat and bring to a boil. Once boiling, reduce heat to medium-low, cover, and simmer 40 minutes until tender. Measure 1/2 cup pineapple, remaining 1/4 cup broth, Bragg Liquid Aminos and red pepper flakes into a food processor or blender. Pulse until smooth. Set aside. Heat oil in a large skillet or saute pan over medium heat. Add the onion and garlic and saute 3 minutes. Add the carrots, peas and red bell pepper and cook, stirring, 2-3 minutes. Add the remaining 3/4 cup pineapple and saute 2-3 minutes. Add the cooked rice to the pan and stir to combine. Saute 2 minutes, then add the blended pineapple mixture. Cook, stirring, 3 minutes, until all of the liquid is absorbed. Remove from heat. Stir in the scallions and serve immediately. This entry was posted in Main Dishes, Meatless Monday, Vegan or Vegan Adaptable, Vegetarian and tagged low-sodium recipes, vegan recipes, vegetarian recipes, Vegetarian Times. Bookmark the permalink. Perfect timing! I have General Tso’s chicken in the crock pot right now. I just texted my husband & asked him to pick up a pineapple on his way from work. I’m so excited to try this; it looks so yummy! WOW, how cool! Really hope you enjoy it, Sam. One word of caution: if your kids are not spicy food fans, reduce the amount of red pepper flakes, or eliminate altogether and season to taste at table. My daughters complained that it was spicy, although my husband and I gobbled up every bite!! I’m a little late on this… but I did indeed make this for dinner that night, and it was a huge hit! And not too spicy at all, although I was maybe a tad shy with the red pepper. I will definitely be making this one a lot! Awesome, Sam!! That music to my ears. Or in this case, words to my eyes? This looks so incredibly good! 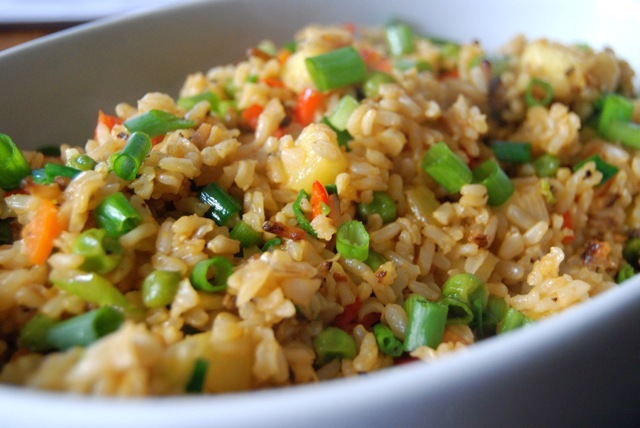 I am in love with the flavors you have used to brighten up this rice, lovely! It is so tasty, and all thanks to Vegetarian Times! Love that magazine. Happy (belated) Valentine’s Day to you, too!! Your’e right, scrambled eggs and/or tofu with this dish – would be terrific. Have a great day, say “hi” to the chicks for me! The chicks send smoochy kisses and hope you had a super Valentine’s day! Fortune cookie companies need to start printing your URL on the back of their fortunes, Dishy… that would make folks happy! Aww, shucks, you make me blush! I think I’m going to have to try my hand at homemade fortune cookies. Maybe next week when the girls are on winter break? Sounds like a fun (and tasty) project to me! This rice looks and sounds super delish; I love the addition of pineapple. Your site and photos are beautiful. What is the size of a serving, a cup, half a cup? Just divide the total amount by six to get the exact serving size.